Thousands of full-time workers took part in the 38th annual J.P. Morgan Corporate Challenge Thursday. BUFFALO, NY — Thursday's record-breaking J.P. Morgan Corporate Challenge drew 14,145 participants across 391 Western New York companies. Alex Simon, from Erie County Medical Center, was the men's first-place finisher with a time of 18:35 (5:18 pace). Nick Masiello from Wegmans was second (18:58) and Jay List from Diamond Cutter WNY was third (19:00). Kim Vona from Batavia Downs was the first-place on the women's side with a time of 20:22 (5:49 pace). Kelsey Gratien of Univera Health finished second (21:01) and Mary Giza from Lancaster High School was third (21:50). 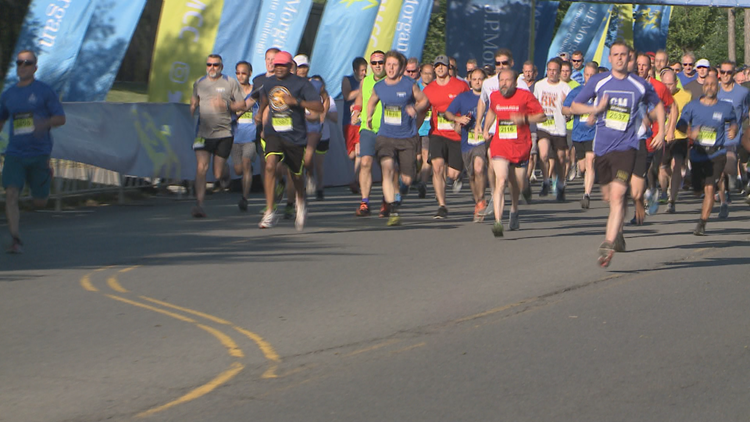 Wegmans had the most participants with 620 runners, followed by Ingram Micro (518), Kaleida Health (408), Buffalo Public Schools (366), Fidelis Care (293), Elderwood (256), Tops Markets (256), HSBC (253), M&T Bank (241), Erie County Medical Center (181) and Moog (179). The first-place men’s, women’s and mixed teams will earn an expense-paid trip to the 2019 J.P. Morgan Corporate Challenge Championship.